We came in late last night and decided we could use a day of rest. The day of rest felt good but it also gave us an opportunity to miss everyone not on the trip (home sick). All y’all’s notes help and we appreciate the thoughts and comments. We did make a run to the gas station to fill up the rig. The price is $1.79 per liter. For the math challenged folks their are 3.79 liters in a gallon which means we paid $6.78 a gallon. Yesterday on the way in to Inuvik we stopped at Eagle Creek the half way point to fill up and buy two sandwiches along with two sodas. I know they were sandwiches because they had two pieces of bread, a sliver of ham, one piece of lettuce and a dab of mayonnaise. This stop $106.44! I can’t figure out weather a $7 gas price or $9 day-old sandwich wrapped in Saran Wrap is worse. The law of supply and demand is definitely at work in this part of the world. 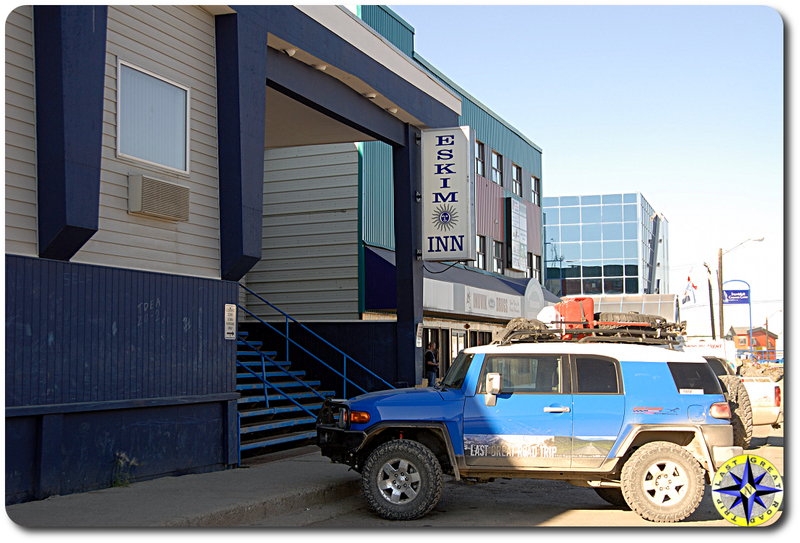 I walked through town… yes walked… down to the Inuvik cultural and visitor center. The woman running the center is Naudia Lennie. She has lived in this area all her life. Naudia and I talked about growing up in the area, the bush, and how energy companies have changed the culture. While Naudia and I talked I heard a theme in her stories of tribal elders and her youth. Her theme is that we continue to have to learn the lessons of respect for all over and over. 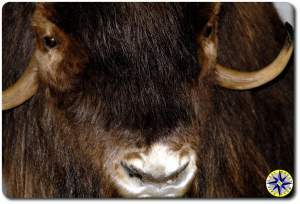 If you have never seen a musk ox up close here is an opportunity. These things are just a decade north of prehistoric and they don’t move unless they want too. This one doesn’t move at all since he is stuffed and standing in the visitor center. While I walked around town Dad was able to catch up on a proper nap. That nap really paid off since after he awoke, he threw together a load of our laundry so we are bright, clean and neat again. And yes one load with all the cloths thrown together. While Mom and Hula Betty are cringing… We have clean cloths even if we mixed whites, colors and darks all together in one load…. Remember we are celebrating diversity. We are staying at the Eskimo Inn. 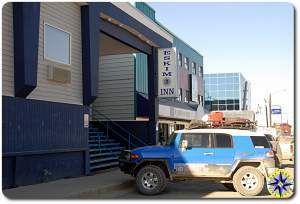 The hotel is popular with the contractors working on the gas and oil rigs out in the ocean. Nothing exciting but the rooms are clean and warm. Dad gets the double bed, I get the single bed in the corner. Did I mention Dad did the laundry… I’ll take the single bed every time. Permafrost is ground that remains frozen for two or more years. Up here we are on the permafrost so the buildings need to adapt to that. 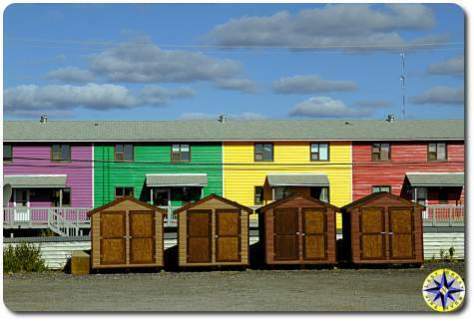 If you set a building on the ground, the heat will eventually melt the earth below and the house will sink. To get around this, everything is set off the ground a couple of feet. Houses, sheds as well as water and sewer pipes. Did i mention we drove 449 miles of gravel road yesterday… not to be a baby but that was a lot and we lost two hours… I know you’re asking your self how did they loose two hours? Well we crossed into the North West Territories and they are in a different time zone. And they don’t use daylight savings… when the day lasts six months the idea of daylight savings doesn’t make much sense. Barbie: Thank you for the b-day thoughts and the Labour Day info. Dad says hi back. John: This was no road… its half run off creek, half horse trail, half two track… a lot of halves make a hole. And yes it was about two miles when we reached the top of a mountain and decided to turn around. The trail continued and we were told that the trails around there lead to old mining claims. Please keep those cards and letters coming, we really appreciate the thoughts and questions. 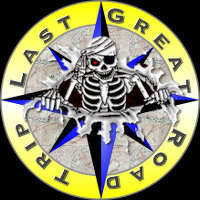 Is thegreatlastroadtrip gonna do a story on you.. they should! I take it the Eskimo Inn offered no room service or nice terry cloth robes. It does, however, look to be one of the more luxurious places you’ve hung your hat for the night. Try the ham sandwich, I hear they put two slices of ham on theirs. Of course mustard and mayo are extra. How many lbs have you guys lost? If it makes you feel any better, I celebrate diversity every Saturday morning. I have never ruined any clothes (falling down, yes; doing laundry, no) and I have a lot of stuff that is red. Now I feel justified. Glad you had a day of rest. The prices up there are amazing! I appreciate the tip, as now I will have an argument ready when someone tells me restaurants in Cancun’s zona hotelera are way too expensive! OK already…wake up, wake up. This is no rest home!